Lock in a great price for Holiday Inn and Suites Trinidad – rated 8.3 by recent guests! It’s location but for the value we will just stay somewhere else La Quinta Inn was same value but allowed a free complimentary breakfast . I would think that for the price we could order a simple breakfast from the restaurant at no cost. We will not be staying at the Hotel again. The view of the Spanish twins and wolf creek pass. Excellent hamburger with fresh-made pub chips. Had to order to the room ... it was prom night and the waiter never came to serve me on the patio. We enjoyed our stay. The staff was very friendly. The room was very clean. The cable channel selection was fantastic. Staff was exceptional. Restaurant and servers were great. The room and hotel were very clean and comfortable. Breakfast was really good and the staff was very nice. Holiday Inn and Suites Trinidad This rating is a reflection of how the property compares to the industry standard when it comes to price, facilities and services available. It's based on a self-evaluation by the property. Use this rating to help choose your stay! 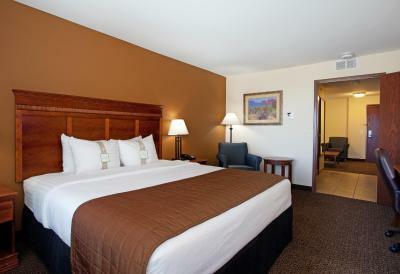 Just off Interstate 25, this hotel is about a 5 minute drive from downtown Trinidad. 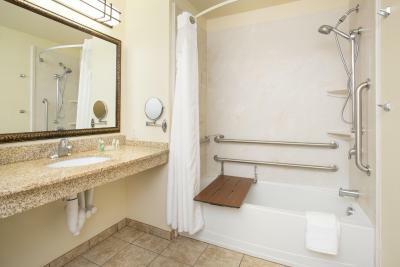 It features an indoor pool and hot tub, an on-site restaurant and rooms with free Wi-Fi. 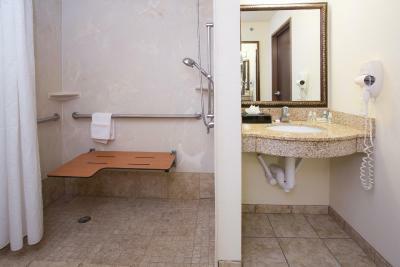 A cable TV and a work desk are furnished in each room at Holiday Inn and Suites Trinidad. The traditionally styled rooms also include coffee-making facilities. Trinidad Holiday Inn and Suites offers breakfast, lunch or dinner at Peak’s Restaurant. It serves American cuisine and a full bar. Room service is available. A fitness center is at the hotel for convenience. Guest laundry facilities are also on site. Holiday Inn Trinidad is a 15 minute drive from the Colorado/New Mexico state line and a 5 minute drive from Cougar Canyon Golf Links. Trinidad Lake State Park is a 25 minute drive away. When would you like to stay at Holiday Inn and Suites Trinidad? Bed preferences are subject to availability and cannot be guaranteed. 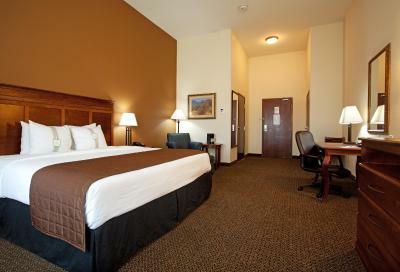 Room features a spacious work area, cable TV and coffee-making facilities. 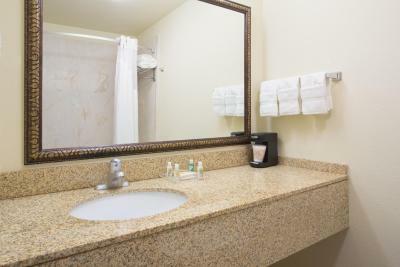 Room features mountain views, cable TV and coffee-making facilities. 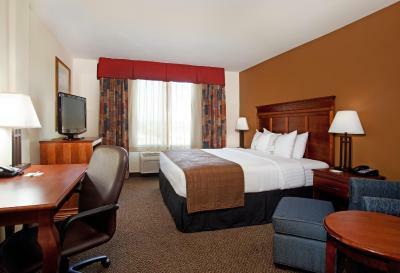 Room features a cable TV, work desk and coffee-making facilities. Suite features 2 queen beds, a full kitchenette and a sitting area with a sofa bed. Room features mountain views, a cable TV and coffee-making facilities. Suite features a full kitchenette, a sitting area with a sofa bed and cable TV. House Rules Holiday Inn and Suites Trinidad takes special requests – add in the next step! Holiday Inn and Suites Trinidad accepts these cards and reserves the right to temporarily hold an amount prior to arrival. Paid for view, but there was no view! I was charged for a date that I did not stay. I was able to get it removed by calling the manager.